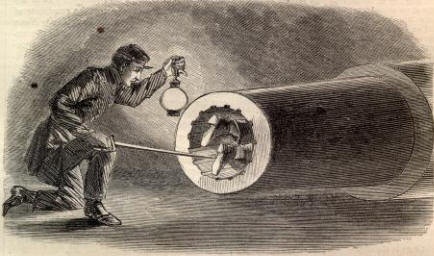 This engraving from Harper’s Weekly shows a fanciful depiction of Dr. Mudd’s real life escape attempt from Fort Jefferson, Dry Tortugas. When the sentences came in for the Lincoln assassination conspirators, Samuel Arnold, Michael O’Laughlen, Edman Spangler, and Dr. Samuel Mudd all received imprisonment. Arnold and O’Laughlen were given life sentences for their involvement in plotting the kidnapping of the late President with John Wilkes Booth. Though the kidnapping never occurred, the law of conspiracy made them accountable for when the plot turned to assassination. Ned Spangler received a comparatively light sentence of 6 years for essentially being an acquaintance of Booth’s and helping to hold his horse. Dr. Mudd was also given a life sentence for aiding Booth during his escape by fixing his leg and for lying to investigators about his previous relationship with him. The four were shipped to Fort Jefferson, an isolated fort located on the Dry Tortugas islands off the coast of Florida, to carry out their terms. The conspirators were not prepared for prison life at Fort Jefferson, Dry Tortugas. The living conditions were harsh. Disease ran rampant with scurvy, dysentery, bone fever, diarrhea and other chronic problems being common among the inmates and guards. While Dr. Mudd and the other conspirators were treated as equally as the other prisoners upon their initial arrival, the pitiable conditions and rotting food was too much for the Maryland doctor. The real straw that broke the camel’s back, however, was the upcoming change of personnel on the Fort. From the conspirators’ arrival in July until near the end of September, they were commanded over by the 110th and the 161st N. Y. Volunteers. Come September, the 161st N. Y. was being relieved by the 82nd U.S. Colored Infantry. Dr. Mudd was a former slave owner and held racial views that were a product of that. Further, as a conspirator in the Great Emancipator’s death, Dr. Mudd also feared retribution or mistreatment by the incoming soldiers. These factors, along with his being away from his family and the amenities of home, drove Dr. Mudd to orchestrate his escape from the his island prison. In the brief two months the conspirators had been there, “thirty or forty” other prisoners successfully escaped according to Dr. Mudd’s writings. Most found freedom by hiding themselves on the steamer ships that brought supplies to the island. One steamer known to Mudd, the Thomas A. Scott, had previously visited the island and left with eight prisoners secreted upon it. To Mudd, this ship seemed to be the best method of escape. In preparation, Dr. Mudd made friends with a crew member on the Thomas A. Scott, Henry Kelly. Kelly was a young man of about 18 and, with the assumed promise of payment for his assistance, he agreed to help hide and care for Dr. Mudd during his escape. With an inside man aboard, Dr. Mudd’s plan was set. 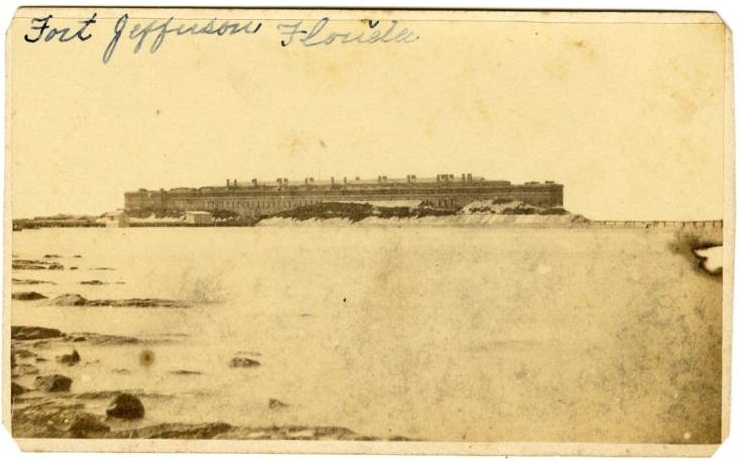 Since Fort Jefferson was such an isolated prison, the inmates were granted greater liberties of freedom than would be found at other penitentiaries. When not tending to their assigned duties (at that time Mudd was a nurse in the prison hospital), the prisoners were allowed almost complete access to the island. They were expected to sleep within the walls of the fort, but they did not have a “bed check” as prisoners today would have. The only time considerable attention was given to prisoners exiting the fort, was on days when a ship was departing the island. On those days it was forbidden to leave the grounds of the fort until the ship had left. Therefore, on the day before the Thos. A. Scott’s arrival, Dr. Mudd freely left the confines of the fort in the evening and slept outside of it, in a shed. The next morning, September 25th, he changed his clothing from prisoner garb into one of the suits he had brought with him. He then took advantage of the hustle and bustle of the crew removing supplies from the Scott and slipped his way down into the lower hold of the ship near the coal bunkers. Here he hid himself, under a platform between two cross beams. While other prisoners would continue to make their escape from Fort Jefferson, Dr. Mudd never attempted to do so again. On October 18th, Dr. Mudd and the other Lincoln conspirators found themselves placed into “the dungeon” that Kelly had escaped from. The military had picked up on a rumor that a plot was being formed to free the conspirators. While the rumor had no substance, it still led to the men being confined to the most secure part of the fort. The living conditions for the men worsened considerably there, and they were not relieved of the squalor until the end of January, 1866. After that experience, it appears Dr. Mudd accepted the impossibility of his successful escape. While he still longed for home, he would not risk the punishment for another failed attempt. Moreover, he accepted his connection to the three other men that were imprisoned with him. Though they were strangers to him prior to the trial, they now shared the same fate, good or bad. For his own sake, and for theirs, Dr. Mudd would never try to escape again. Mr. Summers’ book is the book on Dr. Mudd. He also runs the best website on Dr. Mudd. His book was the prime source for information on the doctor’s escape. Mudd, N. (1906). The Life of Dr. Samuel A. Mudd. Washington: Neale Publishing Company. (1865, October 9). Details of Dr. Mudd’s Attempted Escape. New York Herald-Tribune. (1865, October 12). Attempted Escape of Dr. Mudd. Providence Evening Press. More thanks go to Robert K. Summers. In addition to his wonderful book and unparalleled Mudd website, Mr. Summers visited the National Archives on the author’s behalf looking for more information about Mudd’s escape.